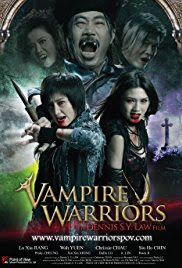 Vampire Beauties: Vampiress Review: "Vampire Warriors"
The Gist: A vampire slayer must save her vampire best friend and her family from a vampire who feeds on other vampires. Clarifications: So the main character of the film is a girl named Ar. Ar is a vampire slayer but she only kills vampires that harm humans which explains her close "friendship" with a vampiress named Max (quotes because the alternate title to this film is "Lesbian Vampire Warriors"). Max and her family are vegetarian vampires which in this case means they only feed on animal blood so they are no danger to humans (though they do wonder what it's like occasionally including a scene where they get hungry over smelling a womans period). One day a vampire comes to town named Mung who only feeds on other vampires. This is fine and dandy until Mung sets his sites on Max and her family and Ar will and does do anything to protect Max. This film fits into the martial arts/horror comedy genre. Selling Point: Pretty much every female in the film is a vampire. Due to her being a vegetarian vampire her and her family vamp out the least if at all. Basically it only happens when she's angry toward the films end. Ar's sister who was a vampire hunter until Mung turned her and has held her captive. In order to defeat Mung, Ar convinces Max to turn her in order to make it an even fight. On top of those there are several nameless vamps, mostly of the evil kind that make appearances in order to be either Stake Fodder for Ar or a meal for Mung. I don't have too many complaints about this film so it gets a Vampire Beauty Rating of 5 out of 5. It's a martial arts film first and a horror last (if you can even call it that) but it works.